This article originally appeared on the Josiah Macy Jr. Foundation website. While I was waiting in the pre-op area for a medical procedure, the anesthesiologist entered the room and introduced himself to me. After asking me about my surgical and anesthesiology history, he asked about my allergies. I reported my allergy to a blue food dye. He responded by checking my wristband to confirm it was listed and proceeded to enter my response into the computer he was charting on. Ten minutes later, a surgical nurse came to ask me a series of questions and started with my allergies. I responded the same way and held up my band. It may sound trivial and perhaps this was just routine protocol to verify, but it did leave me wondering… Did my nurse not speak to my anesthesiologist? What else did they not talk about routinely that they should? While I was most certainly paying closer attention to these interactions than most, the truth is that all patients expect that their doctors and nurses and other team members are on the same page about their care. They have good reason to demand this. 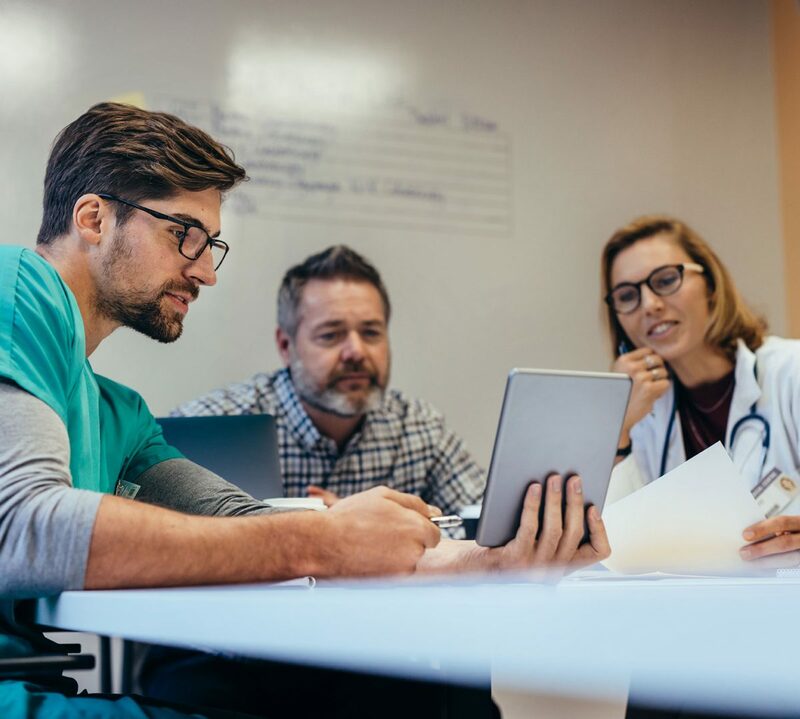 Better interprofessional collaboration is associated with a myriad of positive health outcomes including reduced mortality, reduced length of stay and readmission rates, and higher patient experience ratings. Unfortunately, as I learned firsthand, this is not always the case. I am not alone. Data from Press Ganey patient experience surveys suggest that improving teamwork in hospitals is a key driver to improve patient satisfaction. Why is it so hard to achieve interprofessional care? Unfortunately, there are many barriers to achieving this vision, including the disparate training and practice silos between physicians and other allied health professionals, disparate rules and regulations that apply to different professional roles, as well as institutional policies and routine procedures governing workflow that may prevent team-based care. To make matters worse, all of these barriers to interprofessional team-based care are even more acutely evident in academic teaching hospitals where clinical learning is happening alongside delivery of patient care. This makes achieving the vision of the interprofessional clinical learning environment put forth by the Josiah Macy Jr. Foundation and the Accreditation Council of Graduate Medical Education (ACGME), which articulates the need to deliver patient-centered care in a team-based fashion where everyone is learning and teaching together, a challenge. How can we fix this? At the University of Chicago, with the support of leaders from Nursing, Operational Excellence, and Graduate Medical Education, and additional support from the ACGME Pursuing Excellence Initiative, I am leading the implementation and evaluation of IGNITE (Improving GME Nursing Interprofessional Team-Based Experiences) as my Macy Faculty Scholars project. The premise is simple: there are positive exemplars of both residents and nurses who are exceptional at interprofessional care. What can we learn when we bring them together in interprofessional teams to redesign care? To improve their chances at implementing a successful and sustainable change, we will empower them with training in high reliability team performance principles and improvement science, and arm them with performance data to enable the creation of interprofessional clinical learning environments. Lastly, to incorporate the patient voice, we plan to partner with patient experience representatives to ensure a patient-centered vision. Early IGNITE efforts have shown improved resident and nurse satisfaction, resident learning of team roles, and patient experience with their medical team. In addition to scaling up this vision to more clinical areas, I hope to deepen understanding of the impact of creating an interprofessional clinical learning environment using ethnographic data from direct observations of clinical teams with the assistance of colleagues from Sociology.